The Mark-82 LDGP (Low-Drag General Purpose) is a 500 pound, unguided, free-fall bomb (dumb bomb), part of the U.S. Mark 80 series. The Mk-80 series was developed in the 1950s in response to the need for bombs producing less aerodynamic drag. The Mk-80 series bombs are used in the majority of bombing operations where maximum blast and explosive effects are desired. Their cases are relatively light and approximately 45 percent of their complete weight is explosives. They may use both nose and tail fuzes and conical or retarded tail fins. The Mk-82 is the smallest of those bombs in current service, and one of the most common air-dropped weapons in the world. 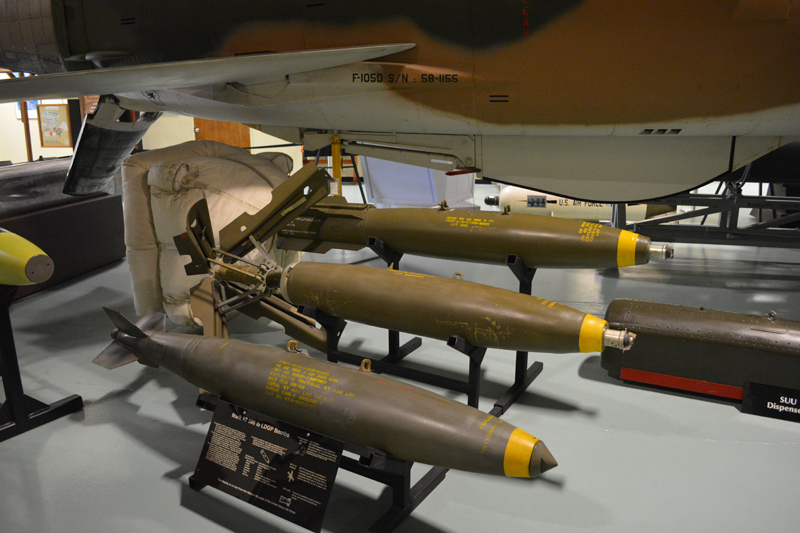 It was used extensively in the Vietnam War and during Desert Storm this series of bombs were dropped from literally every fixed-wing aircraft that supported the ground offensive. The Mk-82 is the warhead for the GBU-12 and GBU-22 laser-guided bombs (GBU – Guided Bomb Unit) and for the GBU-30 JDAM (Joint Direct Attack Munition). Currently the Mk-82 bomb body is manufactured by 17 plants worldwide. Currently only the General Dynamics plant in Garland, TX is DoD certified to manufacture bombs for the US Armed Forces.